Taken over by CuisinArt Golf Resort & Spa in 2013, its sister property, The Reef delivers on the promise of this magnificent setting. 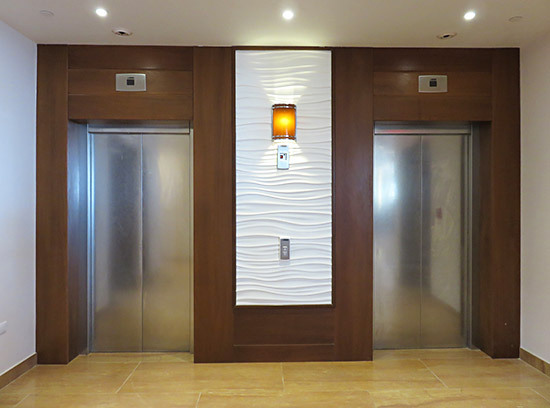 In addition to all of the usual amenities you would expect, two unique features set it apart. 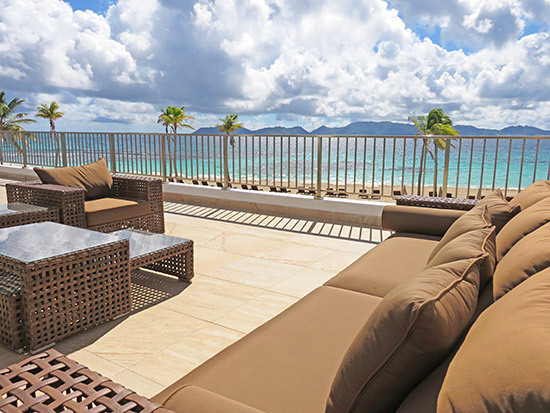 The Reef's ground-floor beachfront suites put modern luxury right on the beach. These would be our first choice. 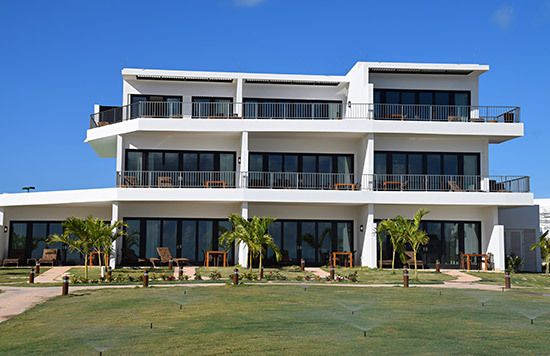 If it is Caribbean Sea view you prefer, those from the resort's top floors (the main house is 5 stories high) are unparalleled. 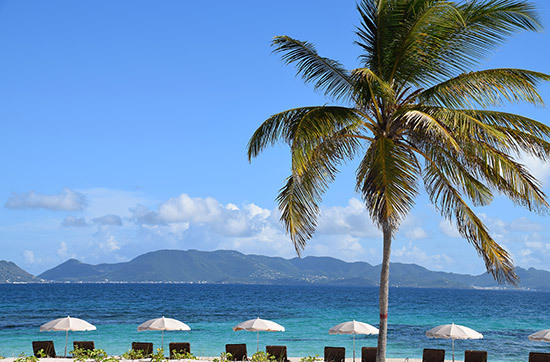 And, with CuisinArt Golf Course immediately behind the hotel, the non-ocean view rooms are sure to delight golfers or anyone who appreciates clean, green vistas. You actually get two hotels for the price of one. 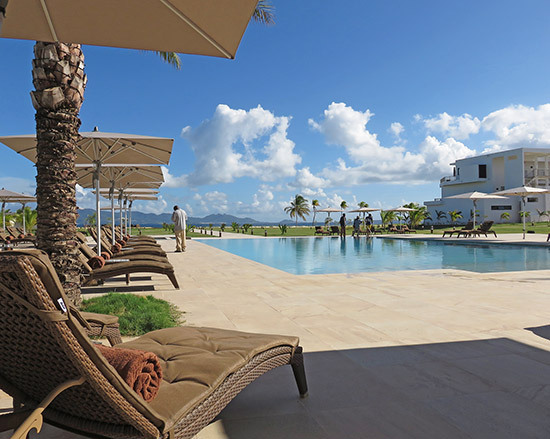 Mere minutes from its big sister, CuisinArt Golf Resort & Spa you have full access to all amenities (spa, gym, restaurants, beach chairs) with signing privileges. The Reef "wows" at "hello." 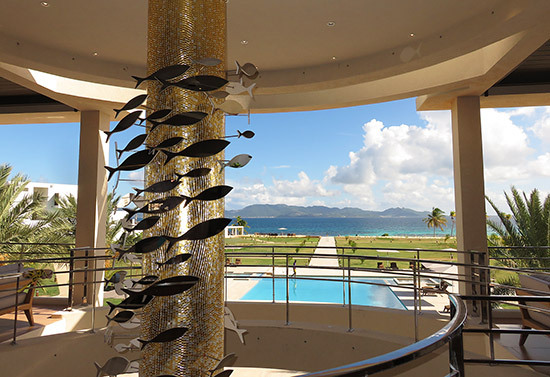 At five stories high, The Reef is the first hotel of its kind in Anguilla. It is large-scale luxury, immaculately glass-clad. The hotel evokes a "this is going to be special" feeling as you pull up. Greeted by a grand entrance, you enter the magnificent lobby. Marble lies underfoot and palatial gold pillars surround you. To the lobby's left is the bar. 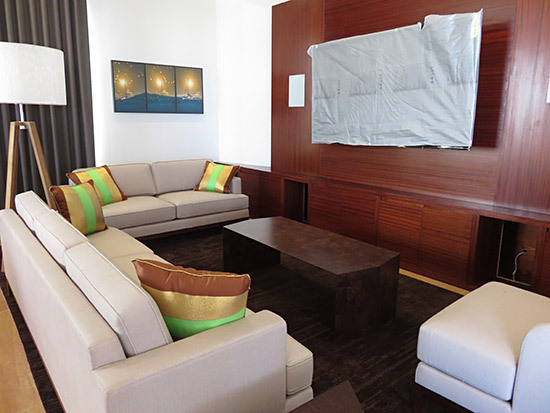 Elegant and sleek, it is on par with the finest hotel bars in the world's "fastest" cities. 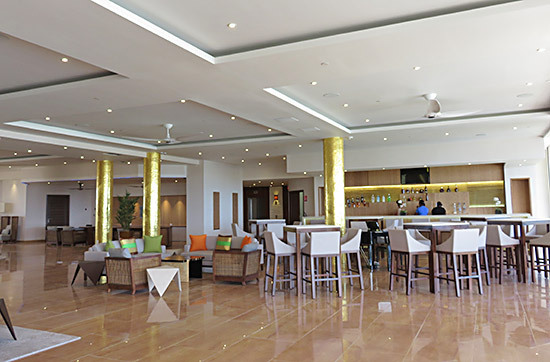 One can easily envision busy, bustling evenings at the bar in high season. Set back from the bar is the gym with state of the art equipment and the bank of elevators. To the lobby's right is the hotel's boutique and another gathering point, a media room with large flatscreen TV. The media room will also be outfitted with iMacs. 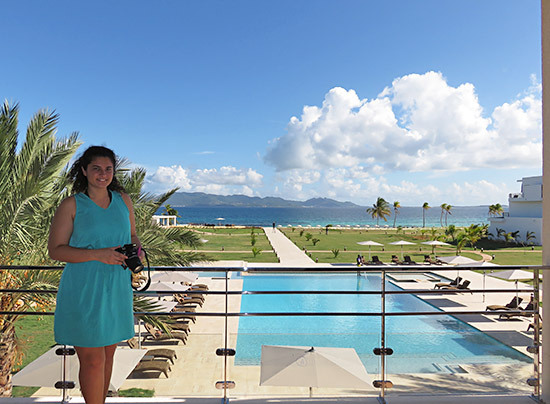 The panoramic views of St. Martin steal the show. This is "high definition" viewing brought to life. 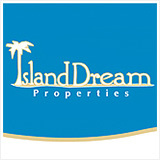 The fresh sea breeze wafts through the open-air space, heightening all senses. An inspired touch that gives a big nod to the resort's name. Like a mirage emerging from a white-sand desert (island! 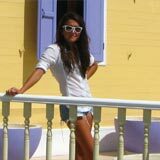 ), the pool invites you to dip in and swim its first length on a walk down the pathway to the sea. All at right angles, the words crisp and refreshing come to mind. Again, clearly inspired by CuisinArt, the gardens are still to grow in. 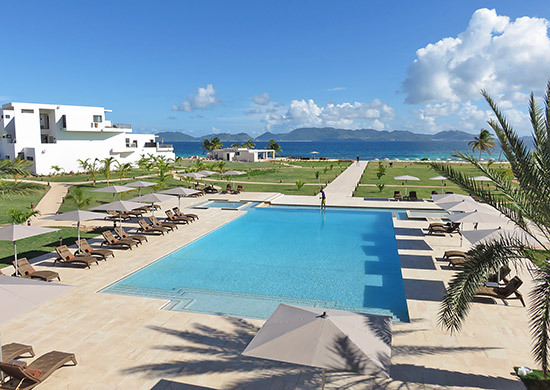 It will be fun to watch the landscaping flourish under the determined care of CuisinArt's crack team of gardeners. The pool is the site for the resort's spa and fitness classes. 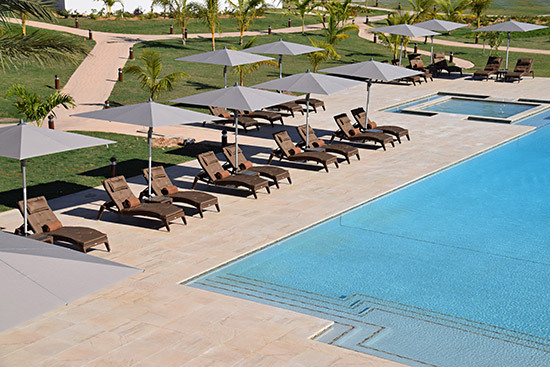 Yoga, meditation and aquacycle fitness classes and spa services are all offered pool-side. The pool has cleverly been designed with four separate areas. The main area (see photos above) is where fitness classes, such as the aquacycle classes take place. There is a second pool level for wading (see foreground of photo below) and two jacuzzis. 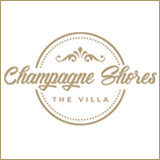 It all backs onto the hotel's main house and its fine-dining restaurant, the Yacht Club. The Reef features two restaurants. The first opens up onto the resort's pool. 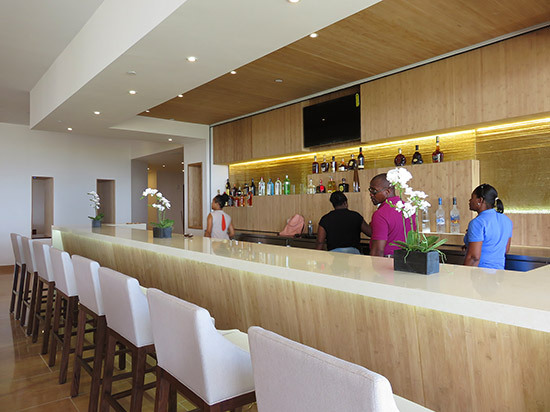 Named the Yacht Club, its design exudes elegance, with textured white walls contrasted against sailing murals. The Yacht Club serves breakfast and dinner. Aptly named, welcome tradewinds gently blow through all of The Reef. They keep this corner of Anguilla comfortably cooler than most beaches and hotels. 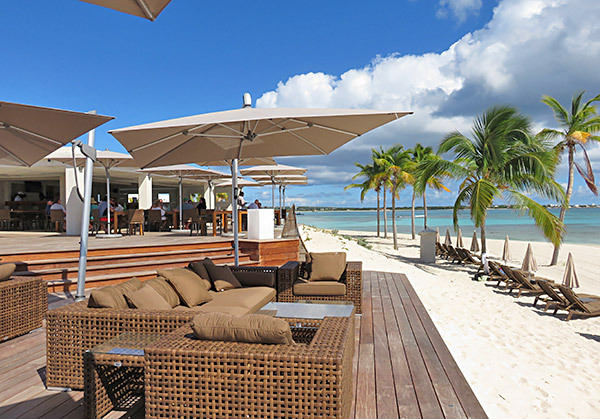 The restaurant itself is has become an Anguilla "beach lounge' favorite. 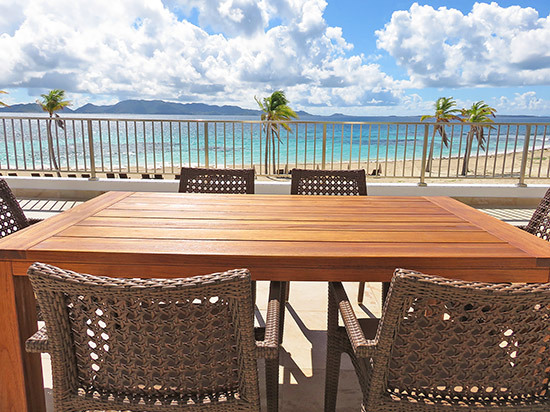 Situated right on the sands of Merrywing Bay, with up-close views of St. Martin and constant trades from the south east, it is hard not to see why this location has been a roaring success. 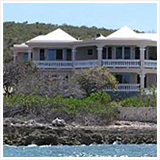 Breezes overlooks The Reef's exclusive hidden cove, Merrywing Bay. 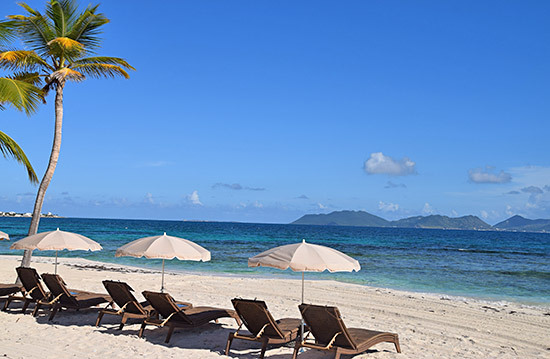 Known by few, Merrywing boasts intimate views of St. Martin and an untouched strip of white sand that curves to neighboring beach, Cove Bay. 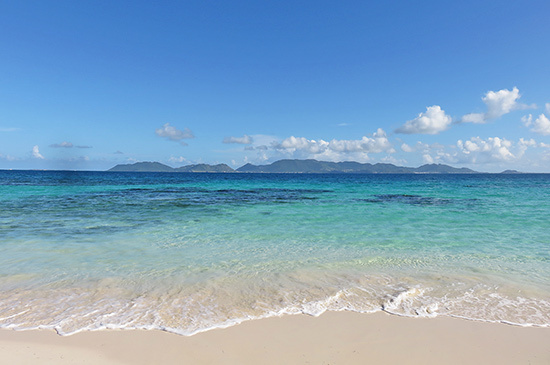 Turquoise shimmers between the area's active reefs, ripe for snorkeling. 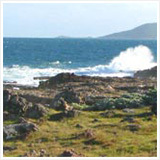 The Reef has designed their water sports program with these very reefs in mind. 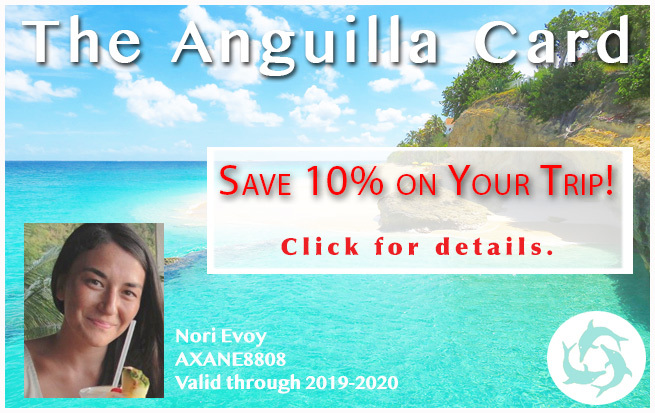 They have teamed up with experts Anguilla Watersports who offer stand up paddleboarding (SUP), snorkeling and glass-bottom kayaking. 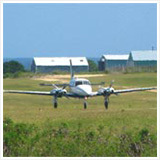 It is all is included in your stay. 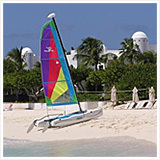 Kitesurfing and direct access to Anguilla's Aqua Park is also available at a separate price. If watersports is your passion, The Reef has it all. 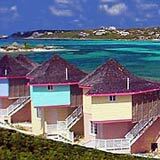 If it is lounging and beaching you prefer, The Reef straddles Cove Bay and Rendezvous Bay. 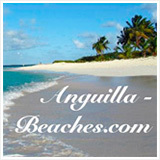 Pop over to these Anguilla beaches or settle into your own cove, Merrywing Bay. 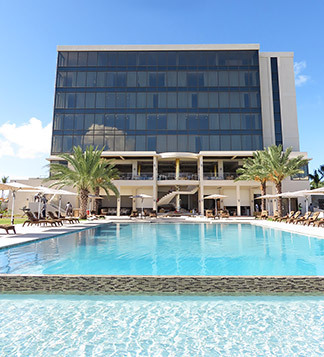 The second floor beachfront suites boast over 1,000 square feet in outdoor terrace space, with couches, dining tables, outdoor showers and even a jacuzzi tub. The jacuzzi tub is an especially nice touch, with the sparkling lights of St. Martin in the distance come night fall. Inside, oversized walk-in closets and sumptuous bathrooms enhance the plush rooms. Not an inch of space has been spared. 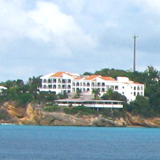 Flanking the beachfront buildings and set further back from the beach are two three-floor buildings. These building house suites and junior suites. All can be adjoined. TIP: Book the corner junior suite in these buildings. The bathroom is divine and you have a wider view! 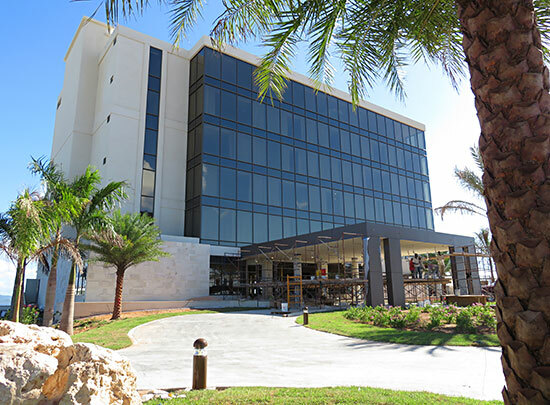 Finally, the hotel's main building, at five stories and with fifty hotel rooms, is situated further behind the oceanfront buildings. The Reef features 80 rooms total. Thirty lay out on the beach in the resort's four separate buildings (the 2 beachfront buildings and 2 set further back from the beachline). Fifty are set inside the hotel's main building. 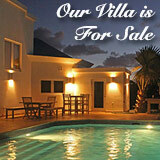 Half look out to CuisinArt Golf Course and half gaze out to St. Martin with views of the sea and the beach. Floor-to-ceiling glass windows provide an intimate and intense view that beckons you to the beach - and beyond. 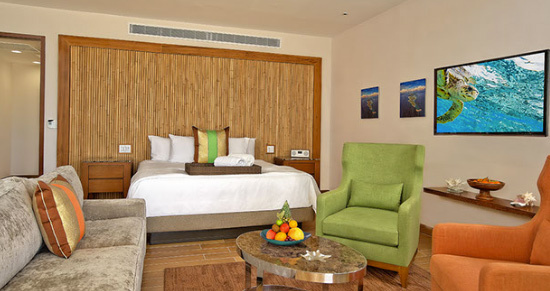 Wood floors, bamboo head boards and pops of color all bring Caribbean-warmth to the contemporary rooms. The most special touch of all? 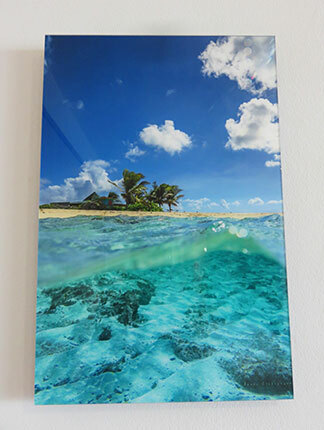 3D photography of beautiful Anguilla. Now that is a picture worth posting! For a look at all rooms, please see the video above. 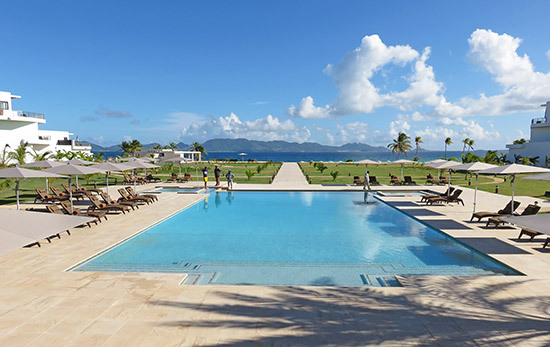 Opulent to the eye and modern laid-back-Anguilla in feel, The Reef is a good fit for the well-heeled adventure seeker looking for an authentic Caribbean experience and a down pillow on which to lay their head.